There are three main flavours of Nox installer, namely the original Disc version, the NoxForum.net version and the GOG.com version. Installing and playing Nox using any of these can be a bit tricky with more recent versions of Windows (7, 8 & 10), following these guides should make that process much more pleasant. Extract the contents of NoxInstall.zip to a location of your choice. Go through all the steps in the installer. Install Westwood Online by running WestwoodOnline.exe as Administrator. Copy the patched WOLAPI.dll to your Westwood Online directory Default: C:\Program Files (x86)\Westwood Online, overwriting the original WOLAPI.dll in the process. Extract the contents of NoxGUI_latest.zip to your Nox installation directory Default: C:\Program Files (x86)\Nox, overwriting game.exe in the process. Right-click game.exe, select Properties, switch to the Compatibility tab and tick the box next to Run this program as an administrator, then click OK. Optional Download and install the music, movies and/or dialog expansion packs from the NoxForum.net Installer Download page. Optional Make a shortcut to game.exe for launching Nox. Now your Nox installation is complete, but you will also need a username & password to play online, the handiest way to register a username is through the XWIS.net website. Extract the contents of NoxGUI_latest.zip to your Nox installation directory Default: C:\GOG Games\Nox, overwriting game.exe in the process. Run NoxSerialFixGOG.bat as Administrator and follow the interactive prompt. For some strange reason the people at GOG.com claim that it is impossible to play Nox over the internet. In actuality, they simply neglected to include the required internet components in their Nox installer. Quoted from GOG.com: "Multiplayer notice: The game's official multiplayer servers have been taken offline and the only multiplayer option available is LAN." They have been contacted about this error and thus far seem unwilling to rectify it. The disc installer sadly is more trouble than it's worth at this point and the process is too complex to include in this guide, so do yourself a favour and get the NoxForum.net or GOG.com version instead. If you forget your Westwood Online username and/or password you will always be able to look it up again on the website. If someone manages to obtain your Nox username & password, you can easily reset your password to lock them out. Assuming the username is available, it will now be registered to your account. You can use the username along with the system generated Game Password at the top of the http://xwis.net/ga page to log in to Nox's multiplayer mode. On first game start you will be presented with a Launch Options screen. Don't worry if you are unsure about what some of the options do, the ones selected by default should work just fine. This is the main feature of the launcher, it fixes many compatibility issues with modern graphics cards. There should be no real reason to ever disable this. ENABLED: Videos can be manually skipped by pressing the ESC key. DISABLED: Videos will be automatically skipped. ENABLED: The game will run in full-screen. DISABLED: The game will run in a window. Modes can be switched in-game at any time by pressing ALT+ENTER. ENABLED: The game will always keep the original aspect ratio, resulting in some black bars around the game while in full-screen. DISABLED: The game will be stretched to fill your screen, with some warping as a result. Modes can be switched in-game at any time by pressing ALT+2. Low Low quality, use only if you have problems with the High setting. Normal Medium quality, use only if you have problems with the High setting. High High quality, most modern computers should have absolutely no problems with this. 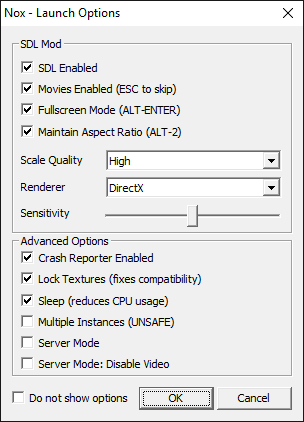 DirectX This should be the best setting to use for anyone running Nox on Windows. OpenGL This should be the best setting to use for anyone running Nox under WINE. Software In the extremely unlikely case that neither of the hardware renderers work, this can bypass them entirely. This slider allows you to increase or decrease your mouse sensitivity, making your cursor move respectively faster or more slowly. If Nox crashes for some reason, this will give you the option to submit crash data to help the developer find and fix potential problems. On some computers this option has to be enabled for Nox to run correctly, if you aren't sure, just leave this enabled. ENABLED: The game will use fewer resources. DISABLED: The game will use far more resources than necessary. Only disable this feature if having it enabled causes problems. This will allow you to have multiple Nox clients open at the same time, which can be handy for map testing among other things. This feature has some side effects when used so it is recommended to keep it disabled unless you actually need it. Use this if you wish to host a dedicated server, you will not be able to play unless you connect using another client. Disables all video output on the dedicated server, saving some resources and improving compatibility. 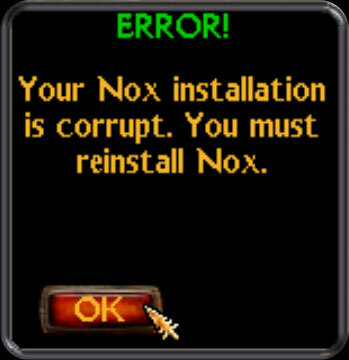 Error: Your Nox installation is corrupt. You must reinstall Nox. If you are greeted with this error message and you are using the GOG.com version of the game, please revisit step 7 from the GOG.com Installation Guide. If this does not fix your problem, your best bet is to completely reinstall Nox. 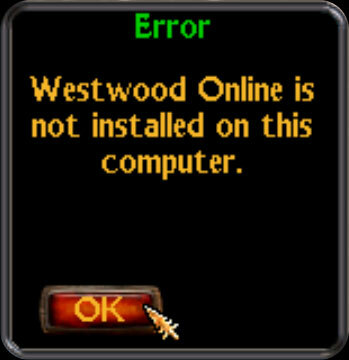 Error: Westwood Online is not installed on this computer. If you are greeted with this error message and you are using the NoxForum.net version of the game, please revisit step 4 from the NoxForum.net Installation Guide. If you are greeted with this error message and you are using the GOG.com version of the game, please revisit step 3 from the GOG.com Installation Guide. If your Nox crashes on exit and you are using the NoxForum.net version of the game, please revisit step 5 from the NoxForum.net Installation Guide. If your Nox crashes on exit and you are using the GOG.com version of the game, please revisit step 4 from the GOG.com Installation Guide. In-game settings aren't saved. / Savegames don't work. / Map downloads don't work. If you run into any of these problems and you are using the NoxForum.net version of the game, please revisit step 7 from the NoxForum.net Installation Guide. If you run into any of these problems and you are using the GOG.com version of the game, please revisit step 6 from the GOG.com Installation Guide. Please like Nox on Facebook and share it with your friends!